LOS ANGELES, CA--(Marketwired - Jun 15, 2015) - Blaze Fast Fire'd Pizza, the fast-casual build-your-own pizza concept known for its chef-driven menu and casually hip restaurants, announced today that it will open a new restaurant, in Orange, CA, near Chapman University, on Thursday, June 18th. To celebrate the grand opening, the restaurant will offer FREE build-your-own artisanal pizzas on Friday, June 19th from 11:00 a.m. to 1:00 a.m. to anyone who follows Blaze Pizza on Instagram, Twitter, or Facebook. The highly anticipated restaurant will be located in Orange Plaza (Orange Circle, 101 S. Glassell St.), in a 3,500 square foot space, with seating for 90. Blaze Pizza is a modern day "pizza joint" that has fans raving about its custom-built artisanal pizzas, freshly made salads, blood orange lemonade and s'more pies. Each restaurant features an interactive assembly-line format that allows guests to customize one of the menu's signature pizzas or create their own, choosing from a wide selection of fresh, artisanal ingredients -- all for under $8. The generously-sized 11-inch pizzas are then sent to a blazing hot open-flame oven -- the centerpiece of the restaurant -- where dedicated pizzasmiths ensure that the thin-crust pies are fast-fire'd and ready to eat in just 180 seconds. Each restaurant makes its own dough from scratch using a recipe developed by critically-acclaimed Executive Chef Bradford Kent ("The Pizza Whisperer"), which requires a 24-hour fermentation period to produce his signature light-as-air, crisp crust. For pizza fans with specific dietary needs, Blaze Pizza offers gluten-free dough and vegan cheese. The Orange restaurant will also feature a selection of wine and draught beer. "I am thrilled to have this opportunity to take the years I've spent developing my dough recipe and now bring it to a broader audience," says Chef Kent. "I am really looking forward to introducing the Orange community to Blaze." 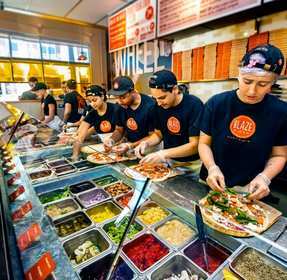 The first Blaze Pizza® restaurant opened on Aug. 6, 2012, in Irvine, Calif., and quickly gained attention for its chef-driven recipes and "build-your-own pizza" assembly-line format. Now ranked as the overall #2 fast-casual brand in FastCasual.com's annual Top 100 list, Blaze Pizza is building momentum and developing a cult following as it expands across the country. The company currently operates 70 restaurants in 19 states and the District of Columbia, including the major metropolitan areas of Los Angeles, New York, Chicago, San Francisco, Dallas and Washington D.C. Founded by Elise and Rick Wetzel (co-founder of Wetzel's Pretzels), the concept is backed by investors including LeBron James, Maria Shriver, Boston Red Sox co-owner Tom Werner and movie producer John Davis.